Interesting reflection, Valerie. I like the idea that projects – a.k.a. the ‘coal face’, or ‘front-line’ – are the key space for you to build relationships, connections, both inside and outside the organisation. Inside projects, goals and deadlines often have firmer boundaries, compared to business as usual effort. As a goal-driven type, I too thrive in these situations. Projects are often a lively space, with unpredictable events. This is something that I feel supports my own creative thinking or doing … I’m certainly not one who craves repetition! 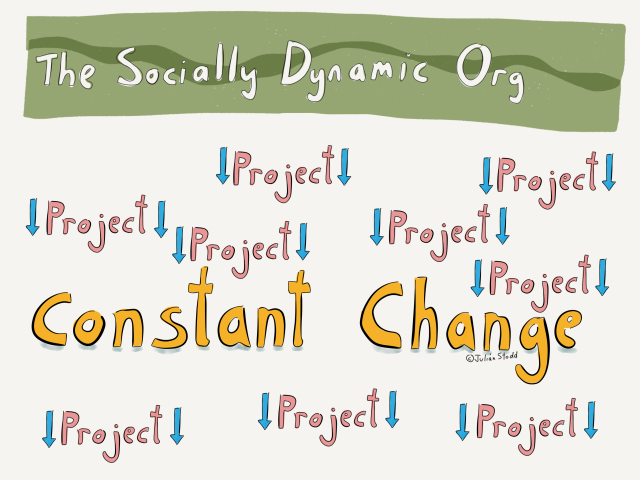 In terms of projects being the blocker for change, as Julian suggested, I think while that can be true in some situations, in a truly AGILE, or CONTINUOUS DELIVERY project, the PROJECT IS DRIVEN BY CHANGE. Real-world feedback from those the project is aimed at, based on their real needs and experiences, so often drives unexpected outcomes, while continuously driving in the direction of value. Agile projects, run on Agile Principles (rather than strict PM frameworks) give us a new way to to consider requirements, aims, budgets, end consumers, and team boundaries. They also has clear, very short term, iterative and testable goals. Daily or even hourly validation of the direction. Is this a better approach for those of us driven by goals and deadlines? I wonder if this is this the new project approach that Julian is looking for?